Share your wonderful animal companion, your love of children, and your love of reading by becoming a R.E.A.D. team. All R.E.A.D. teams are required to be a registered team with a therapy animal registry. 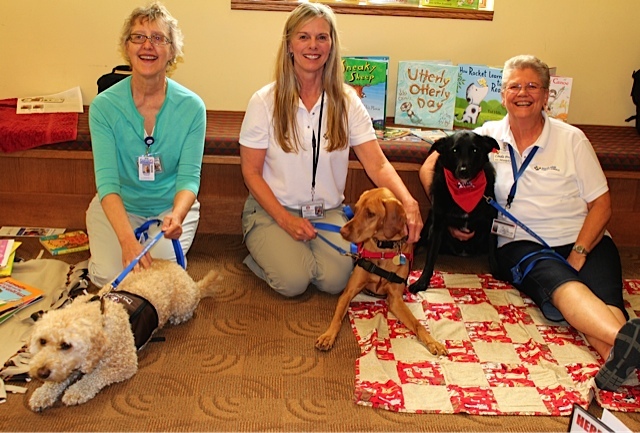 The national registries that are common in Minnesota are Pet Partners (formerly Delta Society), Therapy Dogs International, and Therapy Dogs Incorporated. If you are already a registered therapy team, consider these qualities of what a good R.E.A.D. team looks like, so you can decide whether this might be a good fit for you and your therapy companion. All the qualities of the animal, and enjoy children! If this sounds like a good fit for you and your therapy animal, great! The next step is to participate in a R.E.A.D. workshop or complete the self-study program. If you are interested in becoming a registered therapy team, refer to one of the national therapy animal registration sites listed above or contact local dog training schools. Becoming a R.E.A.D. Team training video introduces the Reading Education Assistance Dogs program and covers the topics of obedience, advanced skills, training and children's books. These videos are a production of Intermountain Therapy Animals of Salt Lake City, Utah. Unauthorized duplication of this video is prohibited, please call 801-272-3439 or email info@therapyanimals.org to order a DVD or additional training materials.